I get around everywhere by bike, public transit and on foot. So when my mayor presented the Mayors’ Council plan during a HUB committee meeting, I was super excited. More SeaBus? B-Lines in my neighbourhood? Bike lanes? YES! All this and more needs to be funded somehow. There’s a lot of fact-slinging, grumbling and even partying happening, so I thought I’d offer my own personal reasons for supporting the plan. And some info along with it. 1. Safe cycling paths are the best! More safe cycling paths means cyclists like myself — and those usually less comfortable riding in the city — can get to their destinations more easily. 2700 more kilometres of bike paths will encourage more people to take up cycling as a convenient, fast, safe and fun way to get around. 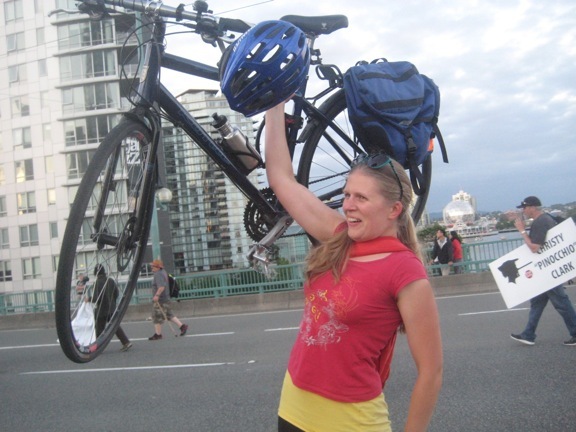 Check out my 6+ reasons why bikes are good for Vancouver. 2. 50% more SeaBus service, woo! 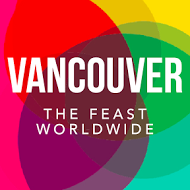 The Feast Worldwide is a day of global dinner parties in 40+ cities across 6 continents. The goal? To spark collaboration that drives local entrepreneurs and social initiatives forward. The idea is simple. Come for an interactive dinner that explores connections between food, community, technology, sustainability, business, health, design, and more! We’re inviting incredible entrepreneurs to share their work to inspire greater discovery and ideas. Let’s sit together over dinner — and instead of talking about problems, talk about ways to support each other, collaborate, and make things work better. Register at Eventbrite and follow the Feast on Facebook for updates. It’s with great pleasure that I share with you a project that was long in the making. 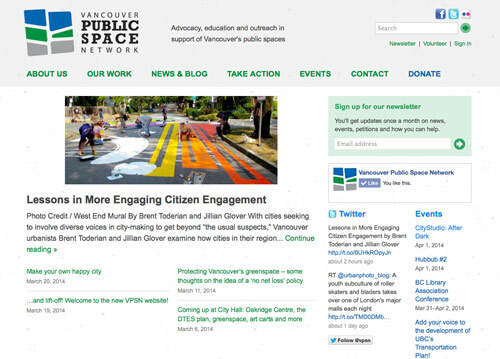 Built entirely by volunteers, the new Vancouver Public Space Network website is a labour of love that began about three years ago. I think that extended anticipation made the ultimate launch that much more exciting for me and, I think, for them. It’s also amazing to consider how much technology has changed since our first conversation. As an advocacy organization, the VPSN works to champion the importance of public space to the overall liveability of the city. … Our work attempts to provide a blend of focused research and design work, creative community engagement and a celebratory, solutions-based approach. I’m proud and honoured to contribute to the success of this important organization that works to improve our urban life. I’m grateful for Nicolas Demers‘ countless hours bringing it to life, and to a team that changed hands partway through and which pulled it all together so beautifully. Alissa, Jillian, Graham, Jessica, Andrew and the rest of you behind the scenes: thank you for taking this journey with me and congratulations! I can’t wait to see where you go. Be sure to check out their upcoming events and please consider supporting the VPSN with a donation. Got a project that needs design love? If you’re with a business or non-profit making positive impacts, I’d love to hear from you. British Columbians are waging a battle against two pipelines and a prospective future that puts at risk much of what we hold dear. There is a huge opportunity in this crisis, however, to supercharge our people power and fight not just for our rights, the environment, and democracy in BC, but to impact the course of future energy use in Canada and abroad. Especially with the upcoming provincial election, the time is now to get British Columbians talking seriously about a clean energy direction for the future that helps us avoid oil sands expansion and a six-degree increase in global average temperature. To help facilitate that, an amazing panel of speakers will be heading the West Coast Oil Pipeline Summit and gala dinner on April 19th. Amongst them, Mayor Gregor Robertson whose team at the City of Vancouver has been very outspoken against Kinder Morgan’s pipeline and tanker expansion plans; Tzeporah Berman, environmental activist; City of Burnaby Mayor Derek Corrigan; and Chief Justin George of the Tsleil-Waututh Nation in North Vancouver, who are directly across from the pipeline terminus at the Chevron refinery in Burnaby. Say yes to beautiful BC. Say no to Kinder Morgan and oil sands expansion. More info and registration at 2ggroup.ca. 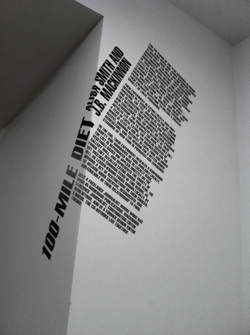 Last week I experienced the WE:Vancouver exhibition at the Vancouver Art Gallery. It’s one of the few shows I’ve seen where the gallery extends beyond art to include design and architecture, and they do it remarkably well. The fact that it’s all local (Jason lamented he didn’t make it in) makes it unique and more personally felt. It did an excellent job communicating our cultural connection with nature through pieces like compelling manifestos by Alisa Smith and James MacKinnon, authors of The 100-Mile Diet, and the Vancouver Public Space Network; video and installation from the Downtown Eastside’s SOLEfood farm (psst! they’re screening Dirt on March 10); and eco-fashion goddess Natalie Purschwitz’s gorgeous outfits are displayed in photo and video. 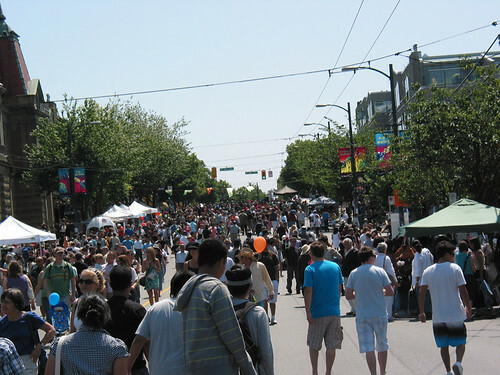 Other installations embrace our vibrant city and ideas as they focus on public spaces, food, and Critical Mass as they relate to Vancouver and its people. Without giving away too much, the exhibit is a visual, aural and physical experience. It has its own gorgeous microsite as well, but don’t let it spoil your visit if you browse the site first, and photos are definitely no substitute! Be sure not to miss Ken Lum’s trippy hall of mirrors on the second floor — take a friend in with you. WE:Vancouver runs through May 1. This daily green blog challenge is in celebration of David Suzuki’s 75th birthday, supporting the David Suzuki Foundation. Please help me out by sponsoring me online now. Note: I am writing solely on my own behalf, and do not claim to represent the David Suzuki Foundation or its views here. 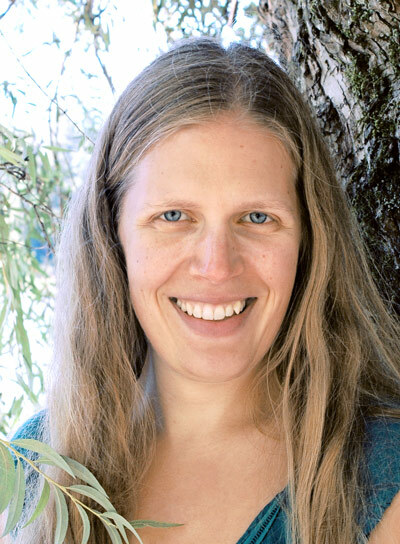 Come collaborate, brainstorm, and meet other green keeners (like me!) at the Greenest City Camp on Saturday, March 5th! 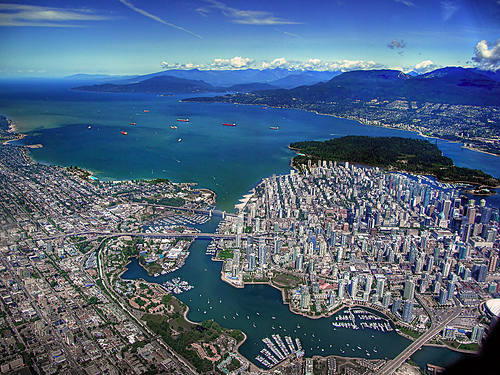 The “unconference” is “a full-day of learning, connecting and finding allies and collaborators to make Vancouver the Greenest City in the world by 2020. This is your chance to connect with Vancouver residents and organizations that are passionate about making this a green city and find out how we can move forward together. It’s about finding people, and the resources, to do what you always wanted to do”, like creating a laneway community garden with your neighbours or reducing waste at work. If that didn’t already get you stoked, there will be food. Mmm, food! the connector of people. If you’re baffled by camp idea, sign up anyway and check out this camp prep webinar March 3. 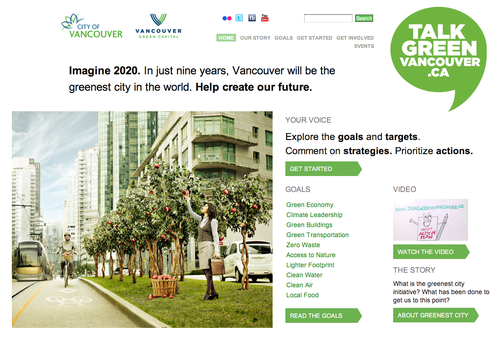 The Greenest City Webinar on March 4 is kind of a “The Plan: 101” so if you’re not up to speed on this (which you should be, cos it’s awesome and exciting), this is your chance to sit back and get educated before the unconference. 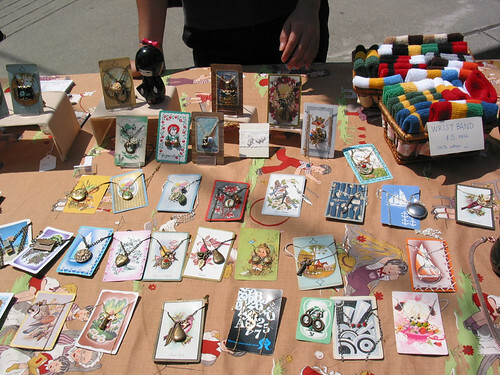 And there are a couple zero waste events on March 2nd, with more info on the Talk Green Vancouver events page. Now go register for the unconference! Cyclists on Robson St. Photo by cabbit via Flickr. 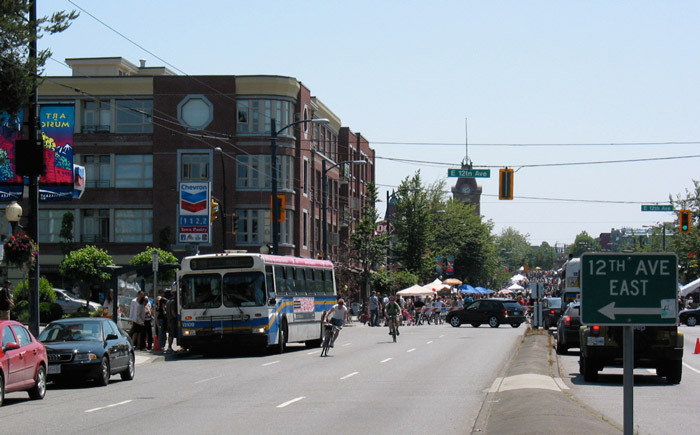 As Vancouver’s City Hall proposes another separated bike lane, this time on Hornby Street which currently has just a regular bike lane, the usual bike vs. car debate fires up again. I don’t see it as a choice of one over the other; we all have to get along. But as a cycling advocate and addict (and the daughter of another — I like to joke that my father was practically born on two wheels), I’d like to share some ways in which bikes make our city a better place, without getting too much into the anti-car realm here. Certainly thinking of these benefits makes me even more resistant to ever using my driver’s license for its primary purpose. The last time I used it was to hand it over so I could test ride a bike! 1. Bikes are the ultimate zero-emission vehicle. I think we all understand that clean air is vital. 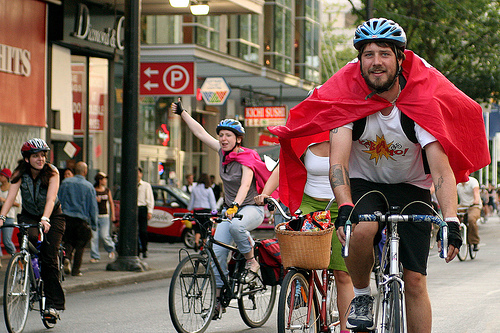 Cycling contributes to cleaner air by taking pollution-emitting vehicles off the road. Having fewer cars on the road results in less traffic congestion, which should in turn reduce pollution further. Because bikes require no fossil fuels to operate (let’s not get into a debate over what fuels the human because everyone eats regardless of their mode), there is reduced strain on our non-renewable resources. We all know oil extraction has catastrophic environmental impacts even without oil spills. Bikes are extremely efficient and use less materials. On the other hand, “These 1,300-kilogram metal boxes carry on average one-and-a-half people, approximately 130 kilos — a mere 10 per cent of the vehicle’s weight” (Yves Engler, The Mark) and require 1,860 calories per mile, compared to 35 for a bicycle, according to the WorldWatch Institute. 2. Bikes take up less space. Whether they’re parked in an apartment or on the street, riding on the road or a trail, bikes require less physical space than cars. And when you have more space available, this makes room for more useful and pleasant aspects of a city: restaurant patios, parks, street food, community gardens, street performers, art installations, and so on. A parking space is private space, not public, when a car is on it. Dialogue takes place frequently online, but in my experience it tends to be short and superficial and, while offering participation theoretically to anyone, the reality is that many voices are left out even within our own city. That’s where dialogue in person can facilitate those deeper connections that might not otherwise be made. It also lets us communicate visually. (And with that, check out RangiChangi Roots.) An event like Pecha Kucha is available to anyone with $10 and a couple hours to spare. It won’t reach everyone, but advertising in offline and particularly free media such as the Georgia Straight (I’m not sure whether it made it to street poles) pushes its reach outside of the—to some degree—exclusive online world. Over 2000 people attended Wednesday’s event, a specially-themed “Walk the Talk, Green Your City”, which is terrifically encouraging. Photo by Szymon Surma via Flickr. 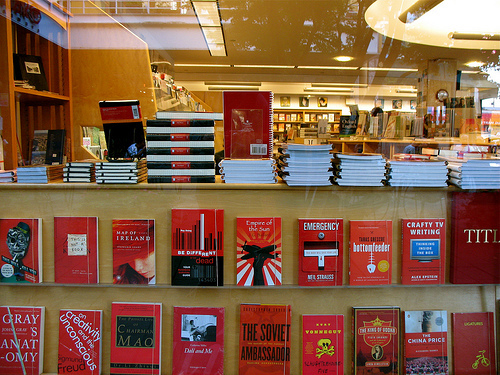 The colour-themed window display changed from blue to a startling black. This was no longer the time for a cheery yellow, or a come hither violet which announced itself in beautifully intricate illustrations. 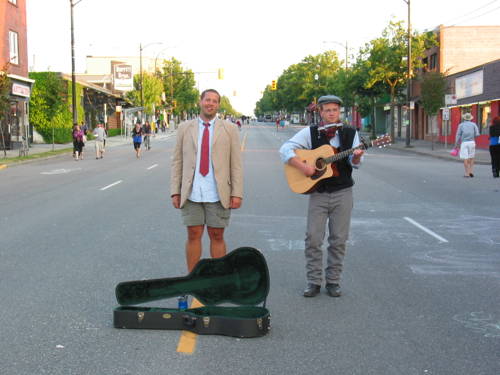 No, it was a display that suggested mourning: Kitsilano’s Duthie Books is closing at the end of February. It is my daily dose of design inspiration on my way to work. The highlight of my short walk after a long bus ride. The surprise, the freshness — what will they think up next? or ooh, they are incredibly clever/thoughtful/creative! and gosh, that must be fun! (Perhaps I’ll take a page from their book — no pun intended — and rearrange my own every so often. But I will need more first.) I have enjoyed it day after day for over a year. I have even sometimes wondered if others watch me staring at the covers intently and ask themselves what could be so fascinating. And, as if they knew who was walking by twice a day, the staff put up design books one week and I felt giddy. I cannot think of anywhere else that has helped me discover so many interesting book covers — and potential reads. Design love aside, however, the rotating display is a highlight for many of my colleagues who are as heartbroken as I am to see it go.